Mountain View, CA – December 28, 2011 – Today eHealth, Inc (NASDAQ: EHTH), the parent company of eHealthInsurance, released two new infographics to accompany its recently published report describing the impact of smoking and body mass index (BMI) on average monthly premiums paid for individual health insurance. The report was published as an addendum to eHealth Inc.’s November 2011 ‘Cost and Benefits’ report. 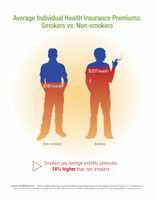 Infographics for the Smoking and BMI report may be downloaded for free through the eHealthInsurance Media Center. In eHealth’s addendum report, comparisons of average premium costs relative to the applicant’s BMI are derived from a sample of more than 229,000 individual major medical policies purchased through eHealthInsurance with coverage in effect as of February 2011. Results are based only on adults aged 20 or older who provided their height and weight on the health insurance application. BMI was calculated based on this height and weight data according to a formula published by the Centers for Disease Control (CDC): (weight in pounds divided by height in inches squared, multiplied by a conversion factor of 703). The BMI categories (Underweight, Normal, Overwight, Obese) used in this report also follow CDC guidelines. Comparisons of average premium costs for smokers and non-smokers in the report were derived from a sample of more than 274,000 individual major medical policies purchased through eHealthInsurance with coverage in effect in February 2011. The status of “smoker” or “non-smoker” is determined during the application process. When collecting personalized quotes and filling out the online application form during the shopping process, eHealthInsurance customers are asked to indicate if they have smoked tobacco within the past twelve months. Underwriting decisions that may influence an individual applicant’s approval or final monthly health insurance premium are not made by eHealth or eHealthInsurance but by the insurance carrier selected by the consumer when visiting eHealthInsurance. Decisions may be based in part on smoking status or BMI. However, other factors (such as an individual’s medical history or the presence of a pre-existing condition) may also play a role. 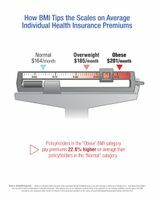 In many states it is possible to be declined coverage for individual health insurance coverage due to a high BMI. 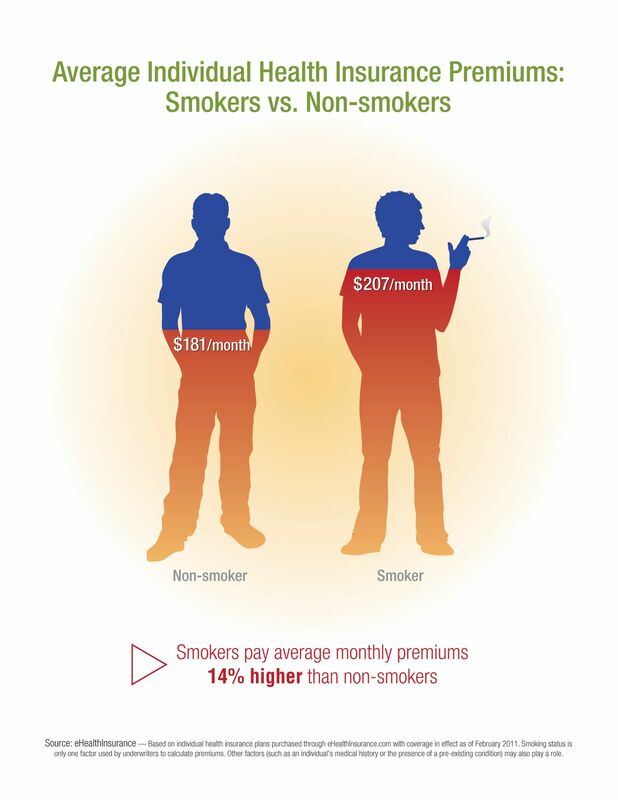 Smokers pay average individual health insurance premiums 14% higher than non-smokers. 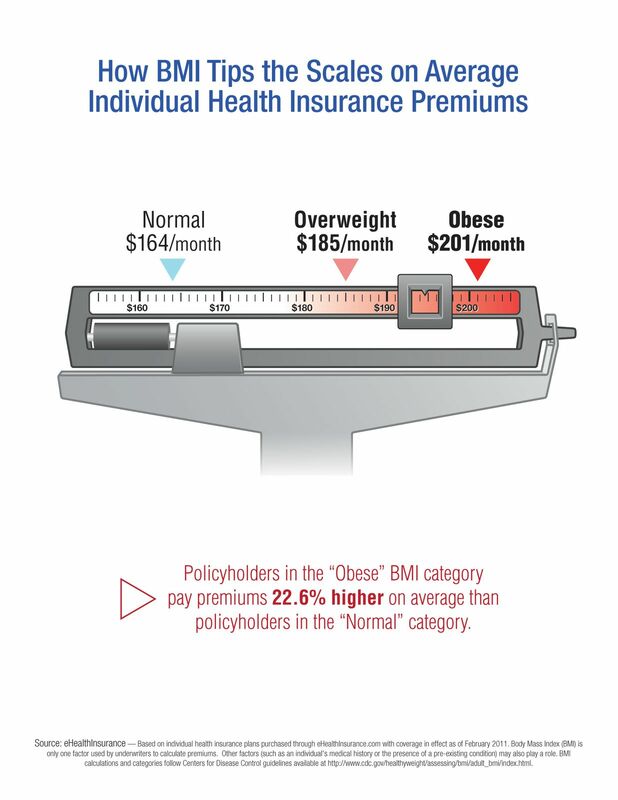 Obese policyholders pay average individual premiums 22.6% higher than those in the normal BMI category.